There is no need to introduce Baruto, the great Estonian Hope, who accomplished this magnificent yusho without a single loss in the Haru Basho of 2006; but which sekitori were winners of the other 3 historic juryo zensho-yushos? Ozeki Tochihikari was the first sekitori to achieve this feat. This farmer's son — the eldest among 7 children — practiced sumo since primary school and was recruited at age 18 by Kasugano beya, during a jungyo on the island of Amakusa. 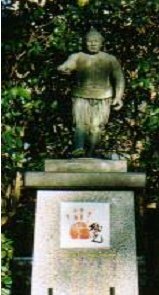 He is regarded as a true hero on his native island, and a bronze statue was erected to honour his career. The second winner is also a farmer's son, Ozeki Yutakayama, who would leave his mark on the juryo division under the shikona Uchida. Born in Niigata province, Yutakayama was a student at agricultural secondary school in Shibata and then at Chuo University of Tokyo. He debuted in sumo on his university team, where he was quickly contacted by the professional sumo world. But it was only after graduation in 1961 that he entered Tokitsukaze Beya, a heya he would bring honour to 2 years later by becoming an ozeki. The third to accomplish this was Kitanofuji, and it was only the beginning of an exemplary career for this carpenter's son. He had dreamed of a professional career in baseball, but he would achieve his success in Dewanoumi Beya, which took him in when he was 15. In 1970 he became the 52nd yokozuna, and he would keep that rank until his retirement 4 years later. He won 10 yusho, 3 of them zensho-yusho. Although unryu was his chosen style for the yokozuna dohyo-iri, Kitanofuji is also known for performing a shiranui-style yokozuna dohyo-iri on one occasion, under quite painful circumstances. It was during the funeral of his friend and great rival, the 51st yokozuna Tamanoumi, in October of 1971.
career records of Tochihikari, Yutakayama (Uchida), Kitanofuji, Baruto.